Just when you thought the unhealthy ties between food, fuel, and financial markets couldn’t get more perverse, we get the announcement that Vitol, the world’s largest independent oil trader, is entering the grain-trading business, hiring a team from Viterra, based in Toronto, to run the show. And lest we toss this off as just another corporate deal, Javier Blas in the Financial Times reminds us that Viterra has itself recently been bought by Glencore, perhaps the world’s greatest global commodity speculator. For the world’s poor, plenty. They’ve already endured three food price spikes in the last six years, fueled in part by financial speculators gambling on agricultural, energy, and metals commodities as they fled the wreckage of the housing and stock market crashes. This corporate deal may not change a thing, but it is a powerful symbol of what’s wrong with our broken food system. Vitol isn’t alone, of course. Mercuria, another leading energy trader, recently hired commodity traders from Morgan Stanley to build an agriculture portfolio. The connections couldn’t be clearer: energy trader hires investment bank to get it into agricultural commodities. 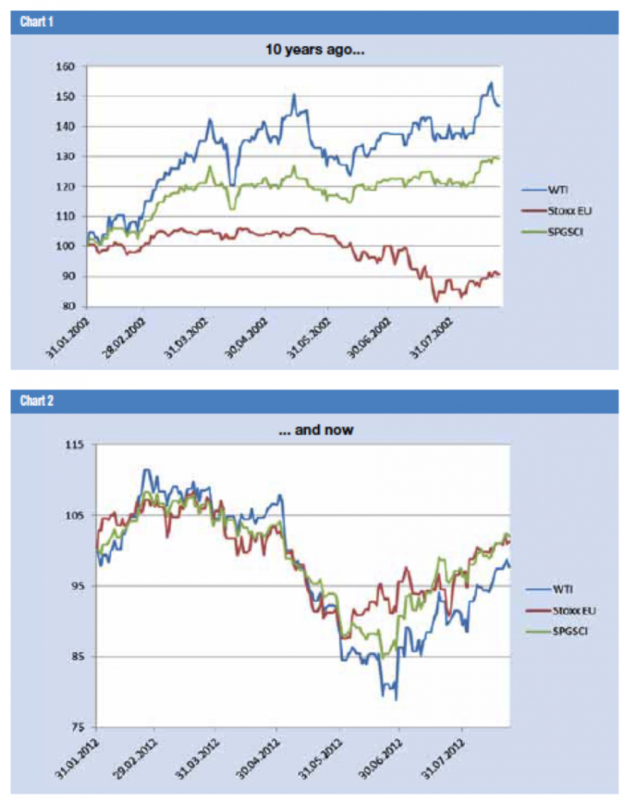 According to Blas, the moves reflect declining profitability in energy. Why? Too little volatility. Remember, the traders are speculating, not investing. They need large and frequent price movements to make money. And if there’s one thing agricultural commodities markets are, it’s bullish on volatility. Blas points out that the extension into agricultural markets is a natural because it can “allow oil traders to profit from the link between gasoline and diesel and the biofuel market.” And who wouldn’t want oil traders, whose interest is making money trading on vast energy markets, to use their insider knowledge to make money from movements on agricultural commodities markets, when in fact oil price movements are one of the main drivers of agricultural futures prices? As a recent Oxfam report documents, the links go the other way as well, with the Big Four grains traders –Archer Daniels Midland (ADM), Bunge, Cargill and Louis Dreyfus, known collectively as ABCD – heavily invested in financial trading in the very commodities over which they have a high degree of control. In 2002, before the rise of biofuels and before deregulated financial markets had gone full-in on commodities, price movements were largely independent of one another. Particularly notable is the opposite movement of the stock market from oil and from the broader commodity index, the very relationship that led portfolio managers to recommend commodity investments as a hedge against stock market losses. In 2012 that hedge was a fiction, though still a profitable one for traders who get paid partly by the trade. As the graph shows, co-movement is nearly complete. Co-movement suggests that supply and demand fundamentals in oil and broader commodities markets, which are indeed independent of one another, no longer determine price. UNCTAD attributes this to “herding behavior” among financial investors still flush with speculative capital in search of quick returns. It hasn’t happened yet, as the financial industry uses the profits from trading to weaken regulations and tie them up in court, a battle that is still going on in the United States. Why does this matter? Because what happens on international commodity markets does not stay on commodity markets. It ripples out through an increasingly interconnected world. Large international price movements, which may or may not be driven by supply and demand fundamentals in those particular markets, drive commodities prices all over the world. Price transmission is by no means immediate nor complete; local conditions and weak integration with global markets still have an impact on local price movements. But global price volatility is highly contagious. 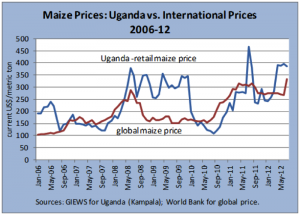 Consider Uganda, a net exporter of maize. As the graph below shows, maize price spikes transmitted to local retail markets, with a short lag. High demand from Kenya, in response to high global prices, contributed to price transmission. Not atypically, the high prices were “sticky,” holding on despite declining global prices. This is often an indicator of the market power of local traders, who can extend scarcity-prices by inducing continued scarcity. Energy traders hiring Wall Street firms to get them into agricultural commodities is truly the least of our problems when it comes to the unhealthy links between food, fuel and financial markets. But it is yet another powerful symbol. More important is getting Wall Street to stop gambling on food, and getting food out of our gas tanks. For more on Timothy A. Wise’s recent work on global responses to the food crisis, click here. I am working on a longer paper on the subject, due to be finished this summer. I will be sure you see a copy when it is finished. Thank you for the encouragement. You can get updated on all my new work at gdae.org by subscribing for updates and checking off “globalization updates”. What’s up mates, its fantastic article about teachingand fully explained, keep it up all the time. content? I mean, I don’t want to tell you how to run your website, but what if you added something to maybe grab folk’s attention? Hello would you mind stating which blog platform you�re using? I�m looking to start my own blog soon but I�m having a tough time choosing between BlogEngine/Wordpress/B2evolution and Drupal. The reason I ask is because your design and style seems different then most blogs and I�m looking for something completely unique.